FIGURE 8-4 Schematic models describing pathways by which hormone-producing cells (E) make their chemical messengers available: (A) paracrine delivery, where the hormone (H) or neurotransmitter (NT) moves from an endocrine cell to immediately adjacent cells; (B) neurocrine delivery, where there is release of NT by the nerve to the local environment, which includes mucosa, other endocrine cells, or smooth muscle; (C) release of H from an endocrine cell that is "open" to the intestinal lumen; (D) release of H to the blood from an endocrine cell that is "closed" and does not have an opening to the intestinal lumen. species. The amino acid sequences of CCK and gastrin are presented in Figure 8-5. All of the biological activity of CCK is contained in the octopeptide, and it is likely that the other larger peptides represent intermediates in processing. In order to achieve full biological activity of CCK, the tyrosine at position 7 must be sulfated. The first five C-terminal amino acids of CCK and gastrin are identical. Interestingly, in gastrin the tyrosine that is at position 6 need not be sulfated for full biological activity. CCK, as determined by immunohistochemical techniques, is found principally in the duodenum and jejunum and also in the central nervous system (CNS), as well as in the nerves of the myenteric plexus of the intestine and the nerves of the urinary bladder and uterus. The two major biological responses affected by CCK are stimulation of the acinar cells of the pancreas to secrete pancreatic enzymes and stimulation of gallbladder contraction. The release of CCK from the endocrine cells in the intestinal mucosa is stimulated by the breakdown products of food in the duodenum, particularly 10-18-carbon fatty acids and L-amino acids. The biological actions of CCK result as the consequence of interactions with two classes of receptors; the CCK-A receptor is predominantly present in the pancreas and gallbladder, while the CCK-B receptor is found in the central nervous system (see Table 8-5). There is some evidence that the occupancy of CCK receptors by CCK may contribute to a meal termination signal, i.e., to function as a satiety factor. Both the CCK-A and CCK-B receptors are highly glycosylated. The CCK-B receptor has an amino acid sequence that is 48% identical to that of the CCK-A receptor. 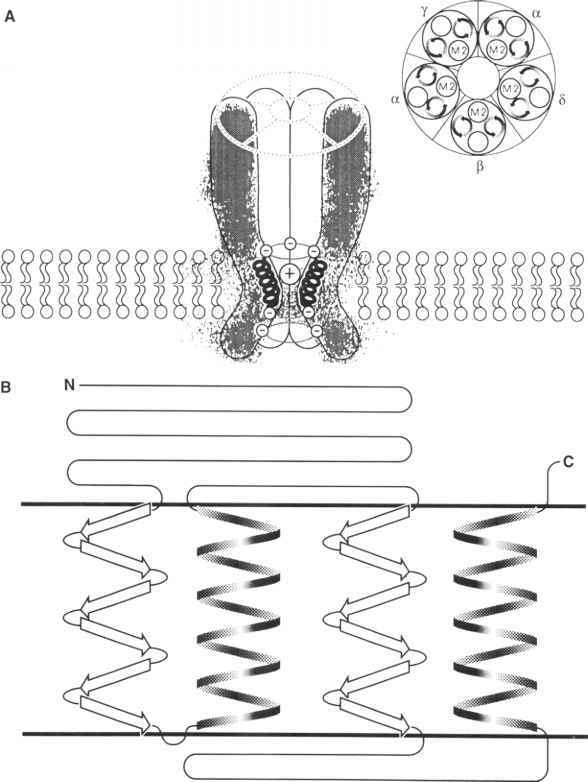 Both receptors contain seven transmembrane domains characteristic of G protein-coupled receptors. In the pancreatic acinar cell, CCK stimulates amylase release via a complex signal transduction system involving IP3, nitric oxides, cGMP, and Ca2+ channels (see Figure 8-15). FIGURE 8-5 Amino acid sequences of CCK and gastrin. For CCK, the minimum peptide with full biological activity has 8 amino acids; however, peptides of 33, 38, and 59 amino acids are known to be present in circulation. Sulfation of the tyrosine at position 7 (indicated by #) is mandatory for biological activity. For gastrin there are three principal circulating forms, G34 (big gastrin), G17, and G14 (minigas-trin); the minimum peptide with full biological activity has 14 amino acids. Sulfation of the tyrosine at position 6 (indicated by *) is known to occur, but is not considered mandatory for full biological activity. A pro form of gastrin of 104 amino acids is cleaved to generate biologically active, variable-length peptides; they are known as big gastrin (G34), small gastrin (Gi7), and minigastrin (G14). All of the biological activity of gastrin is present in the 14-amino-acid minigastrin. G34 gastrin is the predominant species present in circulation (see Figure 8-5). The bulk of gastrointestinal gastrin is localized within the G cells of the gastric antrum; the Gi7 form predominates here. Gastrin has also been localized in the brain. The principal stimulants for gastrin release are partially digested proteins, peptides, and amino acids. Gastrin secretion can also be stimulated by vagus nerve stimulation and the condition of insulin hypoglycemia. Gastrin secretion is inhibited by antral acidification to pH «1.0-2.5. Gastrin release is also stimulated by bombesin and inhibited by secretin, GIP, VIP, and somatostatin. The principal biological action of gastrin is to stimulate the release of HC1 and pepsin by the parietal cells. These responses are achieved via direct interaction of gastrin with a cell-surface membrane receptor and via indirect stimulation of the release of histamine from enterochromaffin-like cells present in the gastric mucosa (see Figures 8-13 and 8-14). Unlike most other peptide hormones, only one form of secretin is known; this single species of secretin has 27 amino acids, with the amino acid sequence given in Figure 8-6. The entire molecule of 27 amino acids is required for full biological activity. Secretin has a structural homology with glucagon, GIP, and VIP (see Table 8-4 and Figure 8-6). Like other peptide hormones, secretin is biosynthesized from a prepro form consisting of 104 amino acids (see Figure 8-7). The mRNA for secretin contains a typical signal peptide and flanking N-terminal and C-terminal peptides. Within the GI tract, secretin is found in the S cells of the duodenum and jejunum. Secretin secretion is stimulated by unknown mechanisms when the acidity of the duodenal contents falls below pH «4.5. 8. Gastrointestinal Hormones TABLE 8-5 Properties of CCK Receptors"